I’m a Star Wars nut, have been since I was a little Jawa. 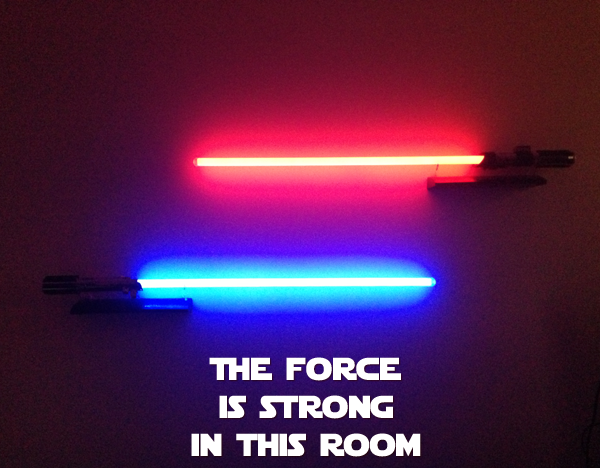 I have some pretty cool Star Wars stuff and 2 of my favourite pieces of my collection are these 2 Lightsabers. Luke’s from Episode IV – A New Hope (The original movie) and Darth Vader’s from pretty much every other movie. I’ve had them tucked away hidden boxes under my bed for too long, today I put them on their purpose built shelves and put them proudly on display in my room. I can Midiclorians growing as we speak!